Industrial cleaners and degreasers contain volatile organic compounds (VOCs), which contribute to smog and air pollution, as well as hazardous air pollutants (HAPs) known to cause a variety of health issues in the people who work with them. Small degreasing operations, such as those carried out in automotive and industrial cleaning, are estimated to add 14% of all industrial VOC air pollution in Minnesota. MnTAP is working to improve Minnesota’s air quality and reduce employee health risk, with grant support from the U.S. Environmental Protection Agency. One effort is helping businesses reduce solvents used for degreasing while maintaining effectiveness without increasing costs. Initial companies that were chosen to participate in this program were located in Duluth and throughout the Twin Cities Metro Area. In 2017 the work will continue with focus on targeted neighborhoods in the city of Minneapolis, MN. MnTAP has worked with over 40 businesses to replace high VOC and HAP cleaning and degreasing products including auto shops, industrial plants, a county facility and a technical college. 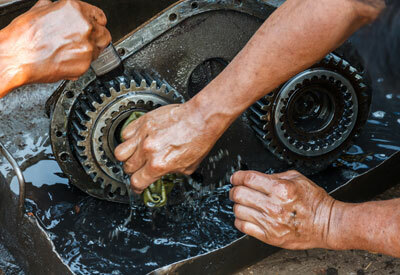 Many common products used in automotive and industrial degreasing operations also contain hazardous air pollutants, chemicals that can cause cancer, respiratory, eye and skin sensitivities and reproductive deficiencies, to name a few issues. Xylene, toluene, ethyl benzene or methanol are some of the most common hazardous air pollutants found in industrial cleaners and degreasers and should be avoided. Here are a few recent successes! When it comes to cleaning and degreasing products, the goal should be to eliminate hazardous air pollutants and Minnesota Chemicals of Concern, as well as minimize emissions of volatile organic compounds and decrease the ozone-producing potential of the product. 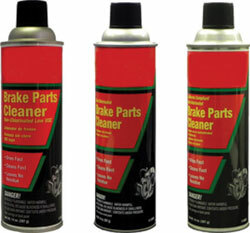 One of the challenges to finding greener brake cleaners is that many containers that look the same contain surprisingly different chemicals. In most cases, the only way to differentiate between hazardous and environmentally friendly brake cleaners is by looking up the product part number on the Safety Data Sheet, available from the manufacturer. Penetrants are another product used in auto repair shops that emit VOCs. Taking MnTAP’s advice, Lake Elmo switched to Liquid Wrench, which is VOC-free. Used with heat, Vandelinde says they didn’t’t see any reduction in performance. Two other low-VOC cleaning products were already in place at Lake Elmo Repair before the MnTAP degreasing project began: Oil Eater for washing the floors and built-in equipment, and a Cuda aqueous parts washer. Vandelinde said the Oil Eater cleans the shop equipment extremely well without damaging the paint, and the Cuda cleans better with soap and water than chemical solvents — without the messy cleanup. When is the best time to evaluate your cleaning and degreasing operations? Now! In late 2015 the EPA strengthened ozone standards from 75 parts per billion to 70 parts per billion. Minnesota’s air is well under the limit in most parts of the state; however in more densely populated areas such as the Twin Cities, ozone levels are nearing the limit. Video case studies are available for several of our projects. More information about VOCs and HAPs can be found on the Minnesota Pollution Control Agency website. MnTAP continues to give no-cost assessments in small- to medium-size Minnesota businesses.